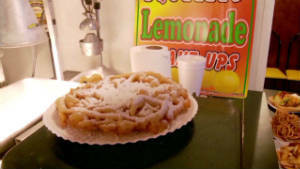 In 2011, CNN's Brendan Polmer ate his way through the Minnesota State Fair and lived to tell the tale of fried cheese curds, fried pie, fried onions (topped with cheese) and so much more. 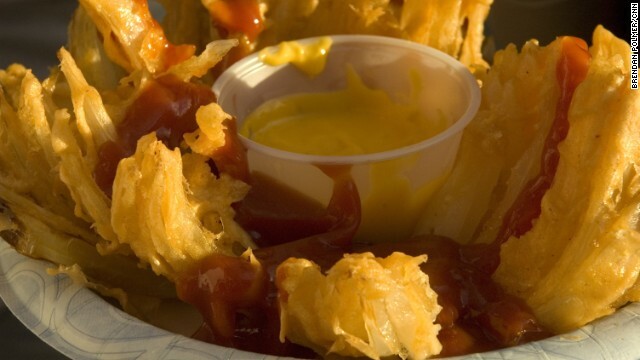 The fair grounds were in full bloom with flowering fried onions covered in cheese sauce and ketchup. 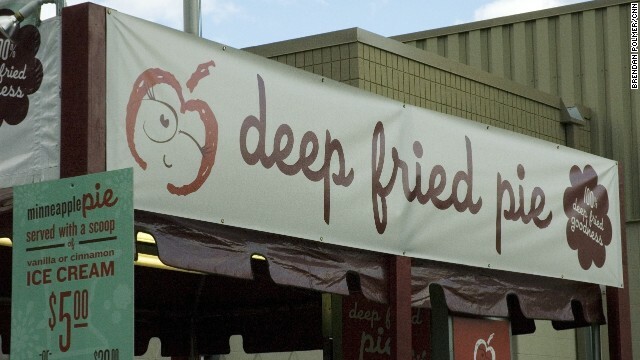 Just as the sign says, the State Fair's version of apple pie involved "100% deep fried goodness." 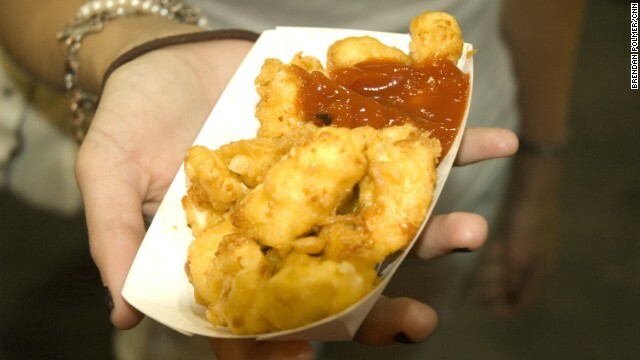 For another State Fair delicacy, fresh and 'squeaky' cheese curds took a dip into the deep fryer. 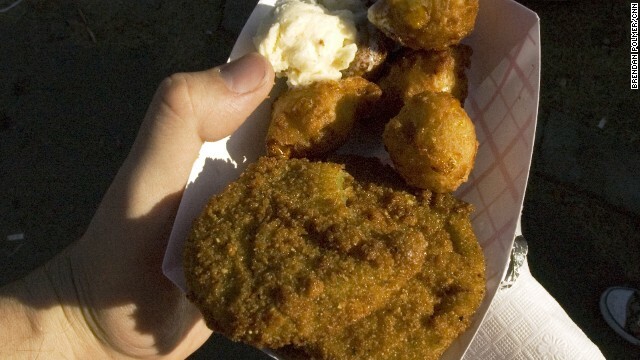 Fried green tomatoes and corn fritters were served hot and fresh with a scoop of honey butter. "Hotdish" is a Midwestern delight, usually served in casserole form, that involves ground meat, some type of vegetable and starch all mixed together with cream of mushroom soup. 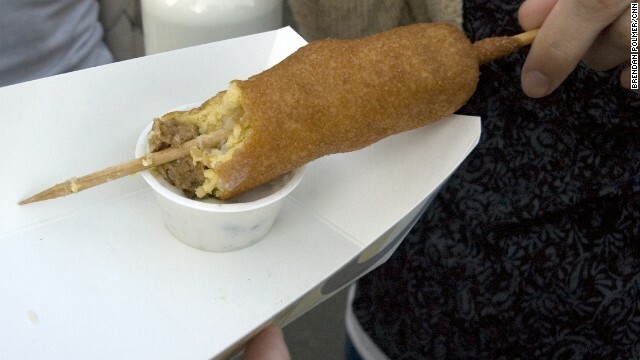 In this version, it was all mushed together on a stick, deep-fried and served with a cream of mushroom dipping sauce on the side. 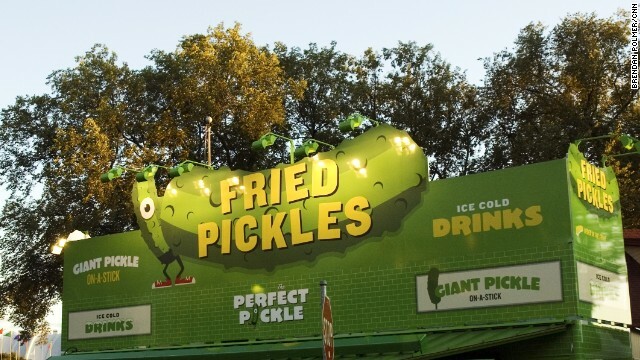 The greenest sign at the fair was a beacon for fried pickle -- or frickle -- enthusiasts everywhere. 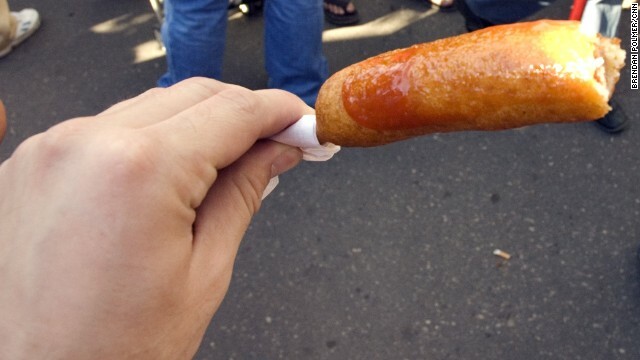 It's deep fried, it's a banana split and it's on a stick. What more do you need to know? 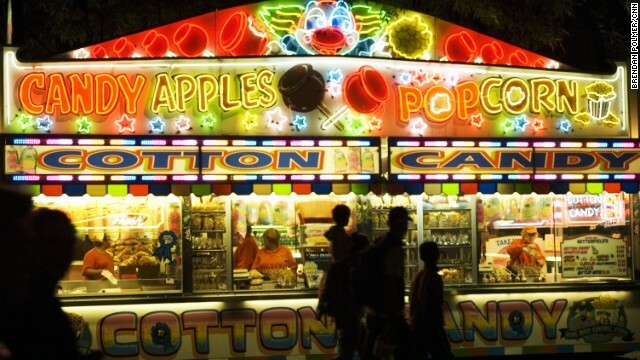 Traditional fair fare such as cotton candy and popcorn is on the menu as well. French fries seem almost tame in these batter-coated, cheese-soaked surroundings. 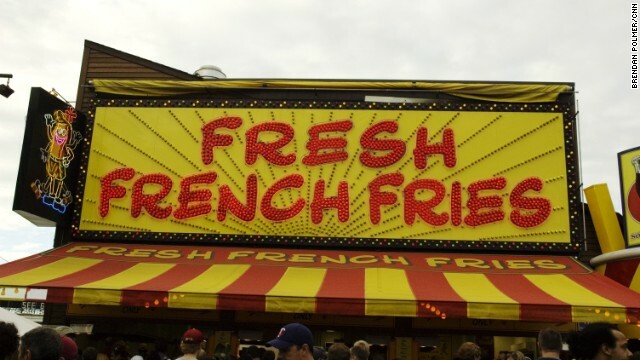 Whether you opt for the classics or take a ride on the deep fried side, a day at the Minnesota State Fair will always stick with you. Editor's note: Kate Krader (@kkrader on Twitter) is Food & Wine's restaurant editor. When she tells us where to find our culinary heart's desire, we listen up. (CNN) -- It's not long now. The end of summer. That's not bad news for everyone. Fall fashion fans. Parents who have spent enough quality time with their kids. Halloween enthusiasts. But it is the last chance to savor some amazing foods that will be gone when summer is over, or not long afterward. Here are some things to try before it's too late. 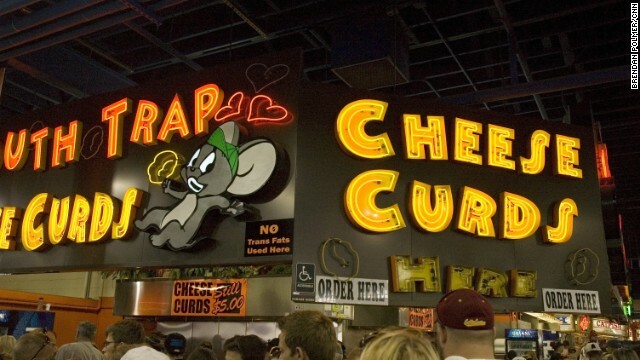 Every year the Minnesota State Fair (which runs from August 21 through September 1), proudly previews foods that most people only dream about, like deep--fried, pretzel--crusted cheese curds. This year, there's a brilliant new snow cone variation. Called SnoRibbons, the shaved ice dessert has a cotton candy--like texture and comes in inspired flavors like strawberry pretzel cream cheese, coffee and doughnuts, and grasshopper pie. For the month of August, these mad geniuses of ice cream are serving farmers' market--inspired flavors such as green fennel and maple; carrot-watermelon sorbet, and the F&W staff favorite, tomato water--olive oil sherbet (tomatoes are supplied by the nonprofit, urban Zenger Farm). This New England spot, which first opened its doors in the 1920s, will close—just for the season!—after the third week in October. In addition to lobster everything (lobster dinner, lobster roll, lobster stew, lobster salad...), they also serve crab, clams, scallops and shrimp, as well as Grape-Nut--raisin bread pudding and homemade whoopie pies. The exception to the closed rule: You can order lobster online for delivery to your door year-round. From Mother's Day weekend until October 20, Pelletier's serves a classic traditional Wisconsin Door County fish boil, from 5 p.m. to closing every night, rain or shine. They stick to classic methods: fresh local whitefish, red potatoes and Texas sweet onions, boiled in stainless steel kettles over a wood fire, seasoned only with salt, and served with melted butter, coleslaw, Bavarian dark rye and honey white bread. Every half hour the kitchen brings the meal to a boil for each seating of guests. All dinners come with a slice of Door County cherry pie. Turner Field's days are numbered: In 2017, the Braves will move to a brand-new $670 million home. But while they keep playing (into October if they can make it past the regular season, fingers crossed), there's the chance to have Frozen Pints: Craft beer--infused ice cream in cool flavors like malted milk--chocolate stout, vanilla bock, brown ale chip and peach lambic. Added bonus: A few sections away, you can get Kevin Rathbun's sliced sirloin sandwich with horseradish cream. His epic restaurant Gotham is just blocks away from the Union Square farmers' market, and chef Alfred Portale takes full advantage of that, serving his all-vegetarian Greenmarket dinner tasting menu just through Labor Day. On the menu: Greenmarket ceviche (with baby beets, watermelon radish, mango and chile vinaigrette), strawberry salad, sweet pea ravioli, and Bing cherries with buckwheat streusel. Most people know the southeastern Connecticut town of Mystic from the '80s classic Mystic Pizza. 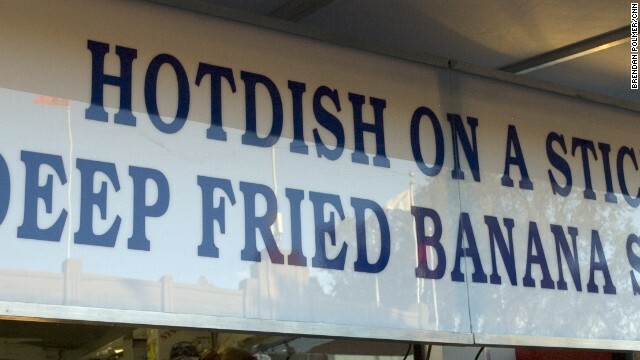 It's also the home of the great roadside fried clam and soft-serve shack Sea Swirl, at the junction of routes 1 and 27. Locals seriously mark their calendars for the spring opening (this year it was Friday, April 4—my colleague, Mystic native Chelsea Morse, marked it!). After September 1, they're open only on weekends and closed entirely for the winter season after October 13. What Sea Swirl is especially famous for: whole belly clams and 24 flavors of soft-serve. Have a favorite summer-only treat? Share it in the comments below.